I was hesitant to purchase this, despite the outstanding reviews, because of the price. I mean, what could be cheaper than rice and toasted seaweed? With that perspective, I was very pleased with these meals/snacks. The rice was more delicious than the freshly made white rice served in many places (possibly even better than the rice in my house) and the wraps are super delicate and with a nice lightly crispy texture that is most enjoyable. I love eating sushi, but ordering from my local sushi place is just too expensive! Also, I'm a vegetarian, so it's hard to find places with a plethora of options, other than the standard avo-cucumber rolls. I decided I wanted to try my hand at making my own sushi, but I was a little nervous about buying the right type of rice, nori, inside ingredients and wasn't sure I wanted to buy a full out kit if I wasn't going to use it very often. I decided this would be a good product that would be that intermediate step - not doing all the work myself, but trying it out nonetheless. - You can put whatever you'd like inside (I like sweet potato or banana rolls myself!). - Easy to make! Just pop the rice bowl in the microwave, spread some rice on the nori, throw a couple ingredients inside, and you're good to go. - You don't have to have just one type of sushi! I'd rather have 10 pieces, each with slightly different contents than 8 pieces that are exactly the same. This allows me to do such. - Easy to bring for work, and like an earlier reviewer mentioned, a fun conversation starter at lunch! Just chop up a couple veggies, throw them in a zip-lock and ta-da, lunch! - No wasabi. This isn't a big deal for me, as I like my sushi rolls condiment free, but my partner likes his sushi doused in soy sauce and wasabi. It does come with a little soy sauce packet, but that's it. - It's not so much a "roll" as a little packet that you delicately have to put together, then shove in your mouth as quickly as possible to prevent it from falling apart. This may be my own ineptness, but I find it a bit tricky to keep together. - I'm not sure you can make inside out rolls (rice on the outside) with this kit. I don't always love the taste of seaweed, but putting a bit of rice on the outside of my "packet" and putting that side in my mouth first works a little. sushi addict... these are great! 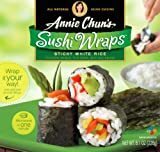 My nine year old daughters love the rice and seaweed wraps. Microwave the rice and you're good to roll. They're vegetarians and recommend carrots, cukes, and radishes for their sushi rolls. The salt had separated from the rice, or something weird happened to this product. The salt is just sitting on top and so the rice tastes wickedly terrible. Either the other folks here who enjoyed this product don't know what sushi is supposed to taste like, or my shipment got ruined enroute to me. I won't order this ever again.